A full range of options are available incorporating face / eye washes and full shower units. Freeze protected combination shower and eye/face wash unit are wrapped with heat trace cable and insulation and are jacketed in PVC to protect them to -50 deg.F. Eye/Face wash features dual spray outlets with automatic flow controls and flip top dust covers. 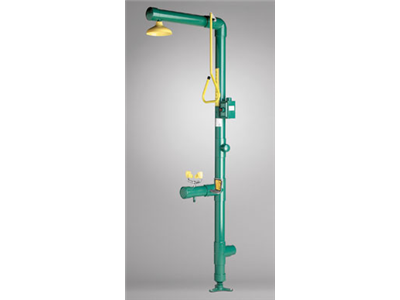 The impeller action shower is activated by a high visibility yellow pull rod. 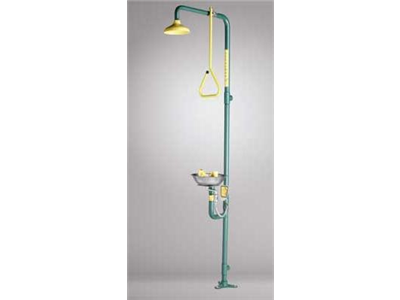 Designed for personal privacy and retention of contaminated shower water. Distinctive white GRP panelling ensures these units stand out from their surroundings. 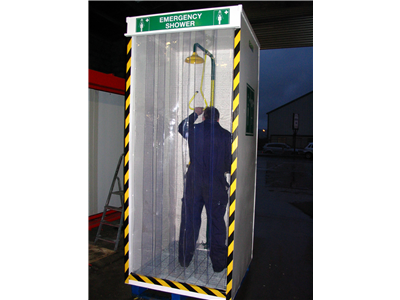 Safety Drench Shower with integrated eye wash bath. Retention capacity for 90L of shower water.Can be fitted with overflow pipe for connection to drain. Range of extras available including shower tester kit, frost protection and step on activation.